Neighborhoods, school zones, construction sites, and dangerous roads could use a little help in promoting compliance with the speed limit. The Howland Police Department would like to assist you in doing just that! With the help of the Howland Police Department, the Speed Monitoring Awareness Radar Trailer (SMART) is currently available for use! 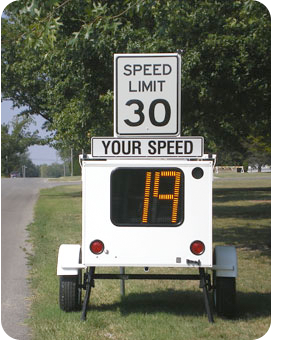 This unit is a portable, self-contained speed display unit that is towed to sites experiencing speed-related problems. A specially designed radar is mounted inside the locked trailer, clocking speeds. Motorists see their speeds displayed on a highly visible LED (light emitting diode) display. The speed limit sign above reminds motorists to pay attention and ease up on the gas pedal. As speed awareness goes up, motorists slow down, even after the unit is moved to a different location. And with fewer speed-related accidents, officer's time is freed up and they can concentrate their efforts on more emergent incidents. Plus, citizens feel safer, which is what compliance with the speed limit is all about: Safety! If you're interested in placing this unit in your neighborhood, please contact the Howland Police Department directly at 330.856.5555.